Northampton MUD brings drinking water to the meter in a utility easement adjacent to your home and maintains a waste water system that begins in a main line in a separate utility easement by your home. We also contract with trash and recycling companies for the district. If you are interested in learning more about the utilities supplied by the Northampton MUD, group tours can be arranged through the MUD office at 281-376-3499. Northampton MUD owns the water supply system. However, it is operated and maintained by a contract with Hays Utilities South, Inc. Operation and maintenance includes making the system meet environmental and safety standards required by law. In addition, Hays is responsible for reading residents’ meters and billing. Please visit www.haysutility.com for concerns, questions and options for paying your bill. In case of emergency, please call 281-353-9809. For your water service or billing matters call 281-353-9756. Hays Utility South Corporation is located at 2200 Sciaaca Rd., Spring, TX 77373. Hays Utilities also handles the reading of the water meters and billing to residents of their water usage. 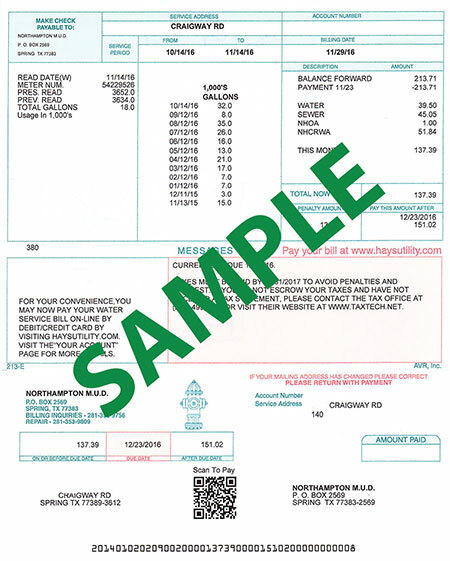 Click the Sample Water Bill for a larger view, and the description of bill line items can be seen below. 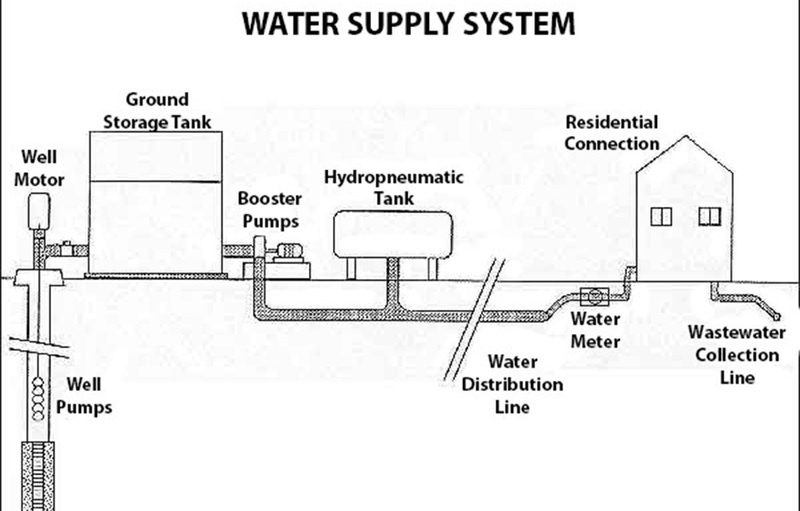 The dollars posted to the WATER line of your bill (line 1) are calculated by the amount of water used multiplied by the current water rate as established by the MUD Board in its “Rate Order”. The rates are determined by the costs associated in getting the water to your meter. The SEWER (line 2) of your bill ($44.95) is a combination of three items. These are $24.35 based on the costs associated with sewage treatment, your trash pick-up flat fee of $17.60, and your recycling fee of $3.00. The NHOA line of your bill (line 3) represents a pass through charge to support the Northampton Homeowners Association. The NHOA is a civic organization that sponsors neighborhood enrichment programs, such as Fourth of July Parade, Chili Cook Off and much more. Click here for more information about how this organization and its activities benefit Northampton. The water bill also includes a USAGE HISTORY, which allows residents to view their usage history for the last 12 months, and a MESSAGE BOX, which is used to convey important information to residents. Your Northampton MUD water bill can be paid by mailing a check to the address preprinted on your water bill. Northampton MUD also offers all of its customers a Direct Payment Plan (auto-pay) to pay your water bill electronically each month. Please contact the customer service department at Hays Utility at 281-353-9756 for more information and an authorization form to begin this convenient service. The single most effective conservation step that can be taken inside the home is to install low-flow showheads. They use 30 to 70 percent less water while still providing invigorating showers. Toilet water use can be cut by up to 70 percent by installing low-flow or air assisted commodes. If you can’t replace your toilet, place a half-gallon plastic jug of water or a toilet dam in your tank. This can cut toilet water use by 20 percent. (Don’t use bricks- they fall apart.) Limit flushes, if possible. Use the waste basket for paper waste. Install low-flow faucet aerators on the bathroom and kitchen sinks. These use about half as much water without compromising performance. Sing shorter songs in the shower. Your shower shouldn’t last longer than five minutes. Sing all you want when you take a bath – just be sure to fill the tub halfway. Turn the faucet off while brushing your teeth or shaving. When washing your car, use a cutoff nozzle instead of running the hose continuously. About 8 percent of home water use takes place in the kitchen. Instead of running water, rinse dishes in a basin and soak pots and pans before scrubbing. Compost your fruit and vegetable scraps to avoid running the garbage disposal. Be sure your dishwasher is full before you run it. Next time you buy a dishwasher, consider the water-saving models which can cut water use by 30 percent. Repair all plumbing leaks immediately. A dripping faucet can waste up to 2 gallons of water per hour. Check your toilet by dropping a small amount of food coloring into the tank. If colored water appears in the bowl after 10 minutes, you’ve got a leak that needs repairing. Voluntarily cut back on lawn watering to no more than once every four to five days with no more than an inch of water at a time. Watering less often not only trains the grass roots to grow deep, but also it supplies the TREES with water. Daily, short term watering usually doesn’t supply trees with enough water to live on. Grass usually goes dorment when it is allowed less water, not necessarily dying. Trees look deeper for water. Use drip irrigation or soaker hoses when possible. To avoid evaporation, water before 10 a.m. or after 8 p.m. If it rains more than an inch, wait five days to water. Northampton has three fresh water supply wells. Well Nos 1 & 2 (Numbered in order of installation) are located behind the MUD building in the front of the subdivision and well No 3 is located on the west side of Northcrest just South of the Willow Creek Golf Course. Well #1 – Drilled April 1968, 843 ft. depth, Evangeline Aquifer, with 710,000 gallon ground storage tank. Well #2 – Drilled July 1972, 1612 ft. depth, Jasper Aquifer, with 400,000 gallon ground storage tank. Well #3 – Drilled Nov. 1988, 980 ft. depth, Evangeline Aquifer, with 295,000 gallon ground storage tank. In 2015, Northampton pumped 325,247,000 gallons of water from its three wells. The average pumpage in winter months was 557,700 gallons per day and the average in summer months was 1,054,380 gallons per day. In the event of a power failure, generators will provide electricity to both water plants. Thus, all three water wells will continue operating and water pressures will be maintained. Water is a precious commodity. Your municipal utility district, Northampton MUD, pumps from groundwater aquifers that are sustainable only by rainfall. Water levels in the aquifers drop each year. As a result we have to lower the well intake screens every 5 years or so, in order to reach the water. By the year 2035, Northampton will most likely be depending on surface water as its main source. District water rates are not set to make a profit…….only set to recover the operating costs of getting it out of the ground, treating it and making it available to you. However, the District does use a rate scale to encourage water conservation. The less water the homeowner uses, the lower the rate as measured by gallons per month. Another way of saying it…..the more water the homeowner uses, the higher the rate. NH MUD water rates have not increased since 2013, although the cost of making it available has continued to rise. In addition to the District charges on our water bill are the charges by the North Harris County Regional Water Authority (NHCRWA), which law requires we collect for them. The NHCRWA is responsible for planning and building the infrastructure for present and future surface water use so it will be accessible (to Northampton included) in 2035! It may seem that we are paying for nothing, but that is not the case. As the demand for water increases and the infrastructure enlarges to meet those needs, the NHCRWA rates will continue to increase. Meters record the amount of water that flows through them by mechanical means, using a “paddle”, somewhat similar to a turnstile. When meters start failing, water under pressure gets by the paddle and meters under-report. Never do they over-report (report more water than actually flowed through). High meter readings are a direct measure of increased use, and that can be due to either voluntary habits or to leaks. Residents are responsible for all water usage on the homeowner’s side of the meter, so it behooves every resident to do everything possible to not waste water, to find and stop all leaks, and to lower their water bill. Be proactive. Look for running/dripping faucets, dripping water hoses, broken water pipes, irrigation leaks such as broken sprinkler heads, and running toilets…usually due to flapper valves. Remember, broken pipes can be located between the meter and your house and even under your slab. Have someone monitor, looking for leaks, especially your irrigation, while you are on vacation. Show them where the water shut off valve to your house is located. See below for a do-it-yourself guideline for locating leaks. Remember, it’s very easy to not realize how much more water you use when it is during a drought period. If you are experiencing high water usage, and Hayes, our water utility operator, reports you may have a leak on your service line or in your house, you may want to troubleshoot before you call a plumber. And if you do contact a plumber, please provide these instructions for testing. Shut off the water service valve where it enters the house. Instruct everyone in the house to NOT turn on any faucets or flush any toilets during this phase of the test. Also shut off the water supply to the sprinkler system. Check the meter. Use caution when opening the meter box. Snakes have been known to visit the area. If there is water standing in the meter box, and it has not rained recently, you may want to call Hayes Utilities @ 281-353-9809. If the clock face dial hand is moving, while the house and sprinkler system is shut off, there is a water leak between the meter and the house. Most meters have a small spinner in the middle of the dial making it easier to see when there is water flow….analogous to a second hand on a watch. If the spinner is moving, it confirms there is water flow through the meter and there is a water leak between the meter and the house. Close all valves to toilets. Don’t ignore toilets that are not used often. They are the most likely to have a silent leak. If there continues to be flow indicated by the meter, first check all faucets, inside and out. Again, make sure to check all areas inside and out that you don’t use often. You may want to call a plumber to investigate further. If there is now no meter flow, most likely, a toilet was leaking. Turn on each toilet individually to see if a flow starts. If it does, that toilet may be the source. Shut off the toilet and continue to check each toilet. NOTE: Even when there is “no flow” you can still have a silent leak. Flappers are the most likely part of your toilet to wear out first. A defective flapper can lose water at a rate that very slowly lowers the tank level to the extent that it may take several hours for the level to drop low enough to trigger the tank to replenish itself. Long story short, for this test to determine this type of leak, you may need to wait several hours for the tank replenishing to happen. A quick, easy and inexpensive way to eliminate the possibility of a silent toilet leak is to simply replace all of the flappers in your house. Shut off the water service valve where it enters the house. If there is no meter flow, open the valve to the sprinkler system (do not activate the sprinkler system, just open the water supply to the system). If the meter now indicates a flow then there may be leak in the supply line to the sprinkler, a valve to each circuit, (or in the case of automatic sprinklers, a solenoid valve to each circuit), or a combination of any. If so, you may want to call a plumber or a landscape irrigation company to investigate further. It is the utility district’s desire for each resident to use as little water as possible, and for each to get the full benefit of what is paid for. So with that said, please always heed the red flag warning of a high water bill and act promptly to resolve the issue. This information is provided as a public service of your Northampton Municipal District (MUD). The sewer rate is a flat fee of $24.35 per month. Below is the current graduated rate order for water. The Texas Natural Resources Conservation Commission annually evaluates our water quality and determines if it is safe to drink. Please see the latest TNRCC report for the Northampton MUD below.